Finally! Just what many customers have been asking for - our solid cherry raised panel sleigh bed. 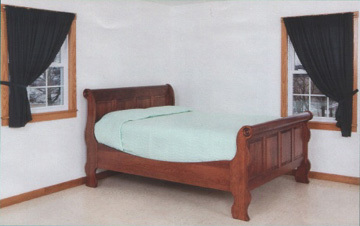 This Amish made sleigh bed is the basis for a whole collection of sleigh-style items that not only covers your bedroom, but also provides bookshelves, storage benches, entertainment centers and cedar-lined chests that can be used in other areas of your home. Combined with a couple of our sleigh style nightstands, a dresser, and a chest of drawers or armoire, you have a wonderful opportunity to have a complete Amish bedroom set with the sleigh theme.